Olá amigos. 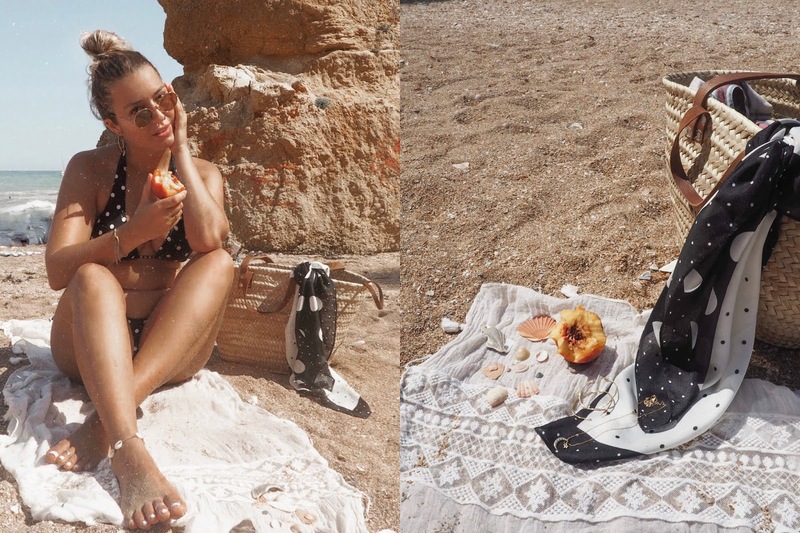 Coming at you today with a slice of sunshine with my photo diary and travel guide from Portugal's dreamy algarve region. 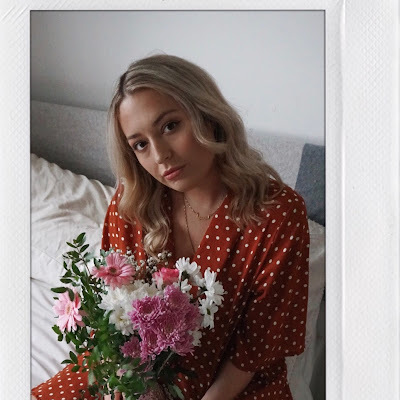 I know we're now well into autumn, but as much as I'm enjoying the crisp cold air and burnt orange leaves – my soul is craving a bit of sun and erm, my burnt orange tan. Plus, word has it temperatures in the Algarve are still a gorgeous 25 degrees. 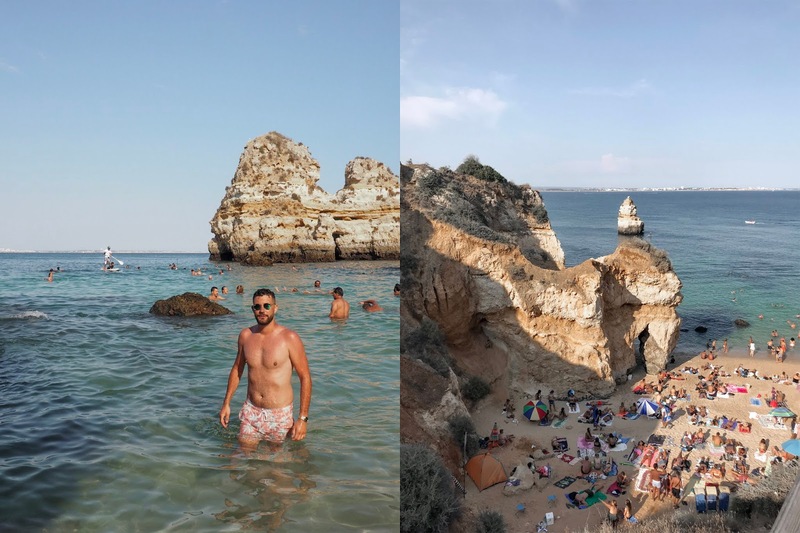 So, if you're planning a last minute euro sun adventure this month (or, are way more organised than me and already planning your adventures for next year) then read on and join me on the wonderful Portuguese adventure I had this summer. And if not, stick with me anyway and I might just convince you. Many algarve destinations can have a reputation as party hot spots for brits abroad. And in the overly-touristy parts, littered with hundreds of enormous all-inclusive complex's, it can be. Great if that's what you're looking for on a girls/boys holiday, but travelling as an adventurous couple, we were after a spot with beautiful beaches, amazing food and traditional Portuguese culture (not forgetting somewhere we could rent our beloved scooter) and Lagos was just that. It's also a great base for exploring neighbouring parts of the Algarve. 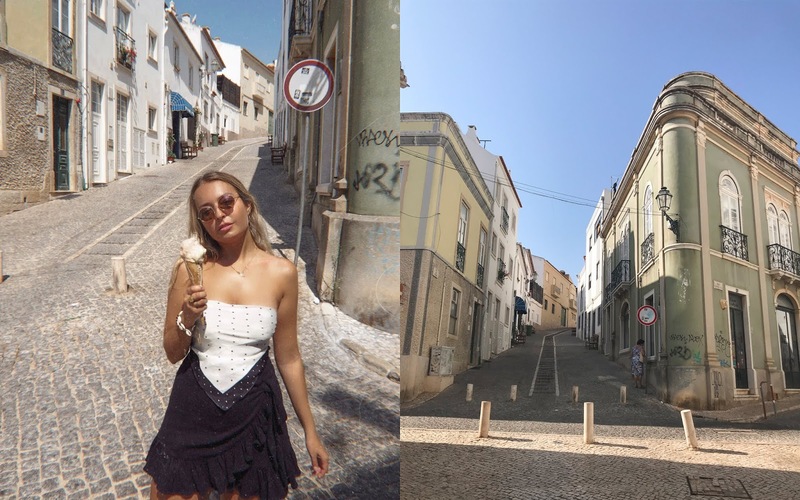 I actually visited here when I was fifteen on a family holiday and remembered the charming old town of Lagos being my favourite place during our Algarve trip. Quaint, constructed of cobbled streets and traditional pastel buildings yet bursting with life through its many colours, bars and gorgeous restaurants. Simply riding through the teeny streets here on the scooter was a beautiful experience in itself. We booked our trip extremely last minute in mid-August, so I'm sure you can imagine most accommodation had already sold out or was going to cost us an arm and a leg. We settled for a lovely little Airbnb a few minutes walk out from the old town. 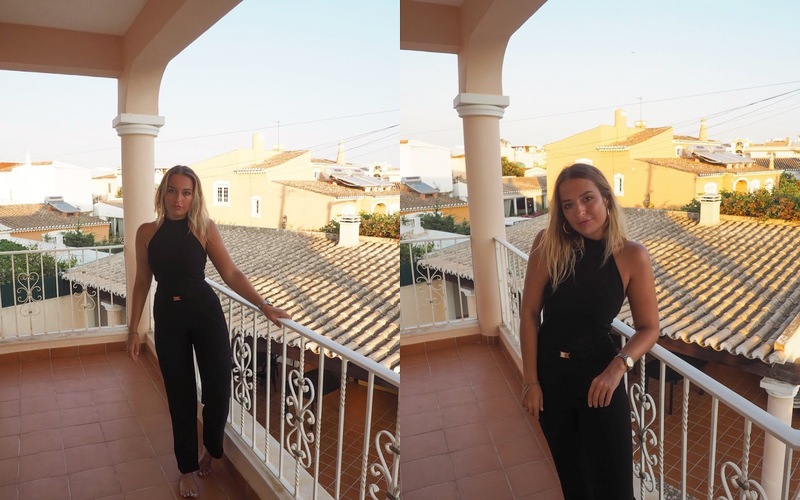 A gorgeous guesthouse hosted by a lovely Portuguese lady called Mariana, with clean, bright rooms and a spacious balcony, a well equipped kitchen (great for those travelling on a budget) and even a pool to cool off in after a day of exploring. 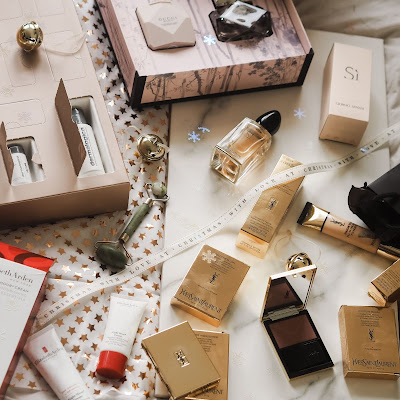 Or to mess around in after a few too many cocktails after dinner, ahem. You can book now for just £33 a night here. As I mentioned, the old town is full of amazing restaurants. Apart from our clifftop picnic (more on that below), we ate out every evening and got spoiled with some seriously good meals. A couple I loved were Taninos, a lovely little wine and Portuguese tapas spot serving some really tasty dishes – I went for a delicious octopus dish that was mouth-wateringly tasty. Another night, on a bit of a whim as we'd left too late to get a table anywhere, we went to an all-you-can-eat Sushi and Asian fusion spot called Dragon and were so pleasantly surprised! Even if we did have to roll ourselves home. But my favourite by far, was a gorgeous spot right near the old town entrance called The Garden. Tucked away in a nook between the cobbled streets is a hidden green oasis filled with fairy-light lined trees, pretty patios and trendy mis-matched furniture. The menu has something for everyone, from local dishes to classics, seafood and plenty of vegetarian options too – I had the veggie lasagna which was insanely good. And what's even more great about this gorgeous place was the value, we had 3 courses each and drinks with the bill coming only to €35! Also, don't forget to stop at Bon Vivant for a cocktail and second story view of the main old town street. Tropical lounge bar is another great newly-opened option with a lovely rooftop terrace and super chilled vibes. But if you're after a proper dancing-on-the-bar, 10 jagerbombs type night, Joes Garage is a must. I'll admit this bar was the first place my best friend and I ever got drunk back on that family holiday, and returning for a night out with bae some 8 years later, it was just as fun as I remember. Except this time it was Connor dancing on the bar, not me. Lagos' coast is also home to arguably the most beautiful beaches in the Algarve. With rugged ochre cliffs offset against the turquoise Mediterranean and littered with stunning natural caves and archways, a day at the beach here is a real wonderful experience. Praia Dona Ana is the most famous, full of vast, scenic cliffs plenty of room to find a spot for the day. My favourite though, was Praia do Camilo, a hundred or so steps down but the beautiful views make it oh so worth it. We spent a whole day here nursing a hangover and wandering through the caves, basking in the sun and taking refreshing dips in and out of the sparkling sea and it was absolute bliss. Get there early for a good spot. Another beautiful spot along the coast we found was Ponta De Piedade. Overlooking the impressive rock formations as the deep blue tide lapped against them, it was the perfect spot for a romantic picnic. 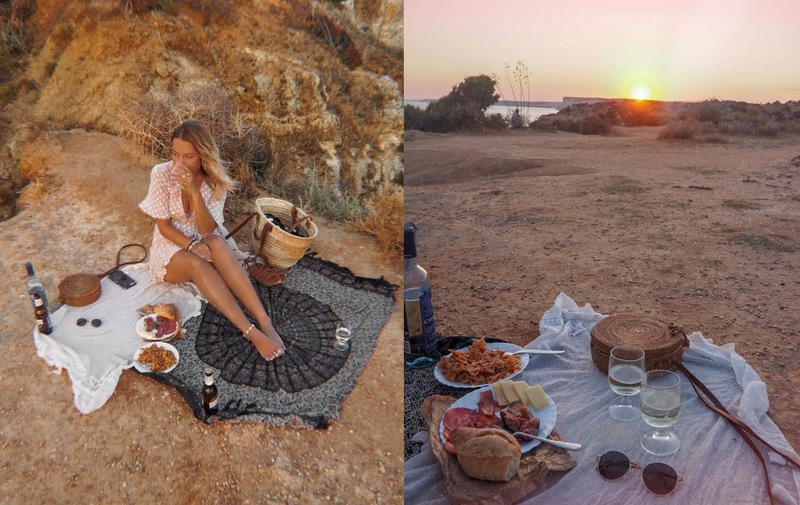 I loaded up my trusty basked with some deli treats from the local supermarket and we sipped vino verde as the sun disappeared beyond the cliffs, one of my favourite nights of the trip for sure and something I couldn't recommend doing enough if you're visiting the Algarve. After riding around everyday on our scooters in Bali, Connor and I were dying to get on a bike again. And honestly, riding around the algarve was such a perfect place to do it – I couldn't recommend it enough. 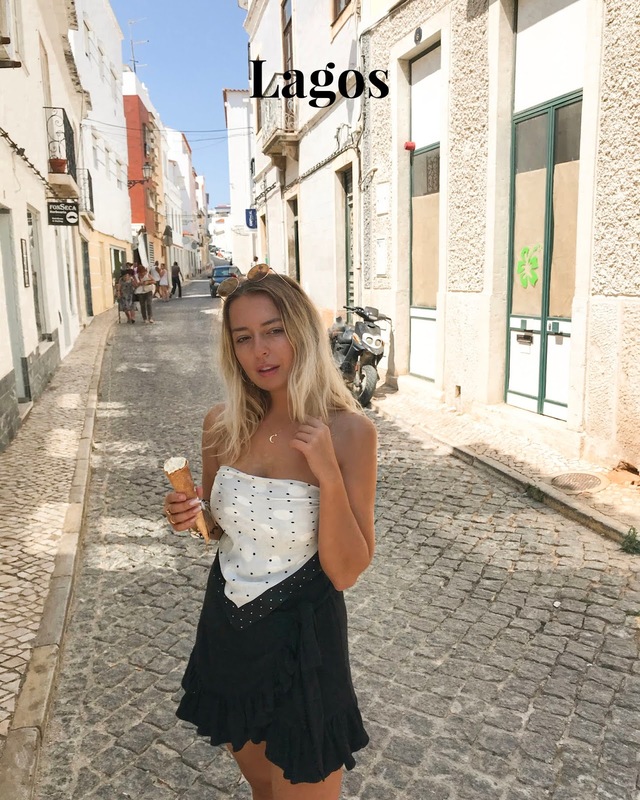 We used a company called Algarve Riders in Lagos, who have several scooter/motorbike hire spots along the southern coast. You can pre-book online or just give them all a call when you're there and they'll come right to your location and pick you up free of charge, our scooter ran well and we got such a reasonable price for three days – these guys are the best. We'd already rode it through the small streets in Lagos old town, but on day 2, it was time to take our new baby a little further afield. 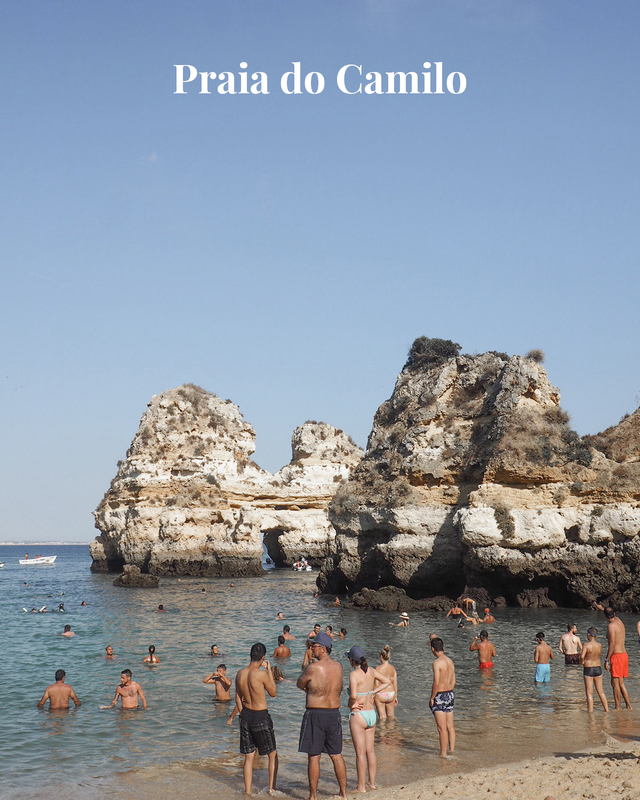 One place I new I really wanted to visit was Carvoeiro in Lagoa, a region full of gorgeous turquoise coves and smaller beach towns than the neighbouring bigger resorts. It was meant to be just under an hours ride from Lagos, but we somehow managed to take a couple of wrong turns. Though it made the journey a little longer, we ended up riding through some of the most beautiful spots. We also somehow managed to get lost in the backstreets of old town Portimão on the hunt for a barbers for Connor (boys and their hair hey) but riding through the narrow, pastel streets here was just beautiful. After getting google maps back out, we ended up riding over a bridge accross the back to another gorgeous spot we stumbled upon, a quaint little harbour town called Ferragudo (the pic where I'm on the bike). We didn't stay long, but had fun riding around the dunes opposite the bay and had a short walk along the harbour. I can imagine it being a really peaceful place to stay for a couple of nights! After finally arriving at Carvoeiro and finding our way around the beach town's tricky one way system, we stopped to enjoy the view and popped into a local supermarket to pickup some snacks for the beach.. Pastiés de Nata anyone? Carvoeiro beach itself was actually super busy, so we headed along to a nearby loaction Praia De Carvalho. A couple hundred steps and climb through a cave later, we'd arrived at the perfect spot for an afternoon of playing in the waves (/ trying not to get totally wiped out by them) and sunbathing. Not forgetting scaling the encompassing cliff walls to get those 'gram shots... safe to say Connor was not amused. A must on your algarve beach-hitlist. Sagres was the last day trip we did with the scooter. 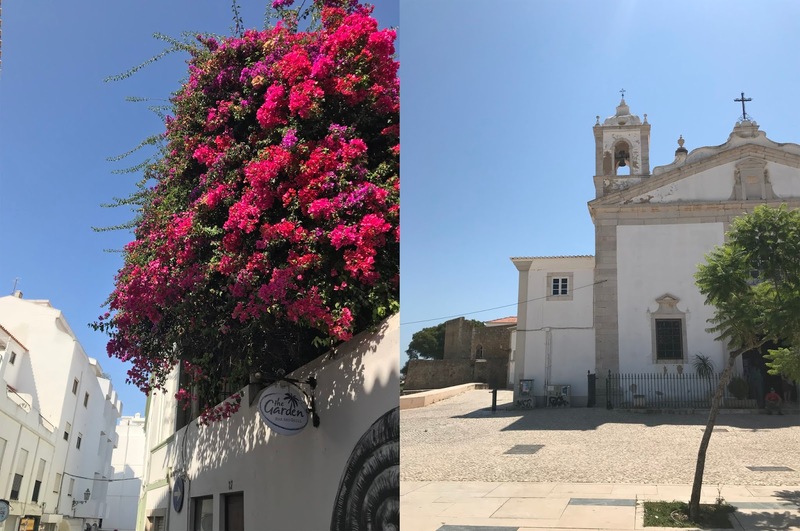 There's plenty of beach towns and coves along the Algarve, and after already seeing so many beautiful spots in Carvoeiro and Portimão the day before – we opted for something a bit different with a little more culture. 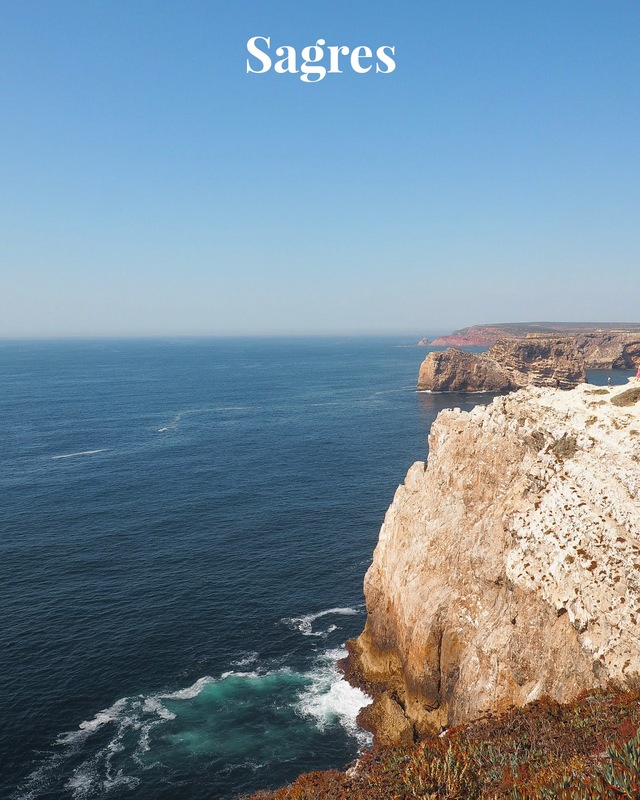 Sagres, most especially Cabo Sao Vincente; the vast headland there, is famous for being the southwestern most point of Portugal and mainland Europe. Which of course, meant the ride down was pretty bloody windy! You'll want to hold on to your helmets and take it steady here, but the ride was lovely and Scenic none the less. 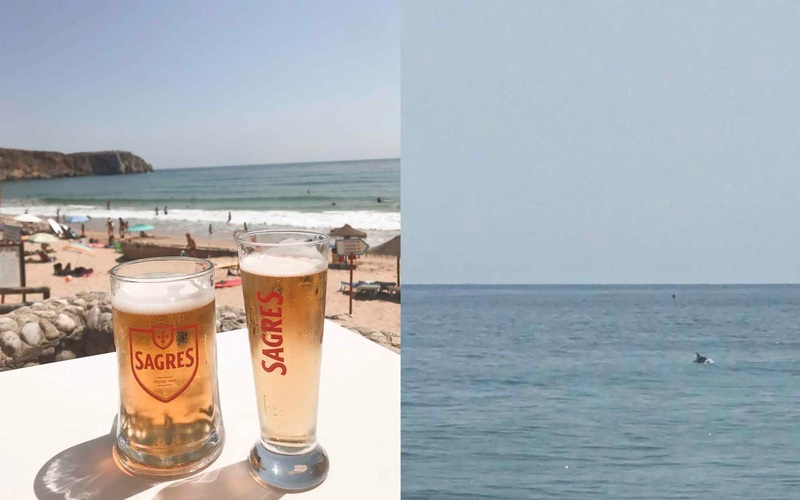 We arrived around lunchtime and headed straight to Praia Da Mareta, the beach closest to Sagres town, for a beer and bite to eat on a shoreside restaurant. Sagres itself is quite sparse and the beach was nice, but not as stunning as the coves we'd seen in Lagos and Carvoeiro. What did make this place super special though, was a pod of dolphins making a special appearance just a few meters from shore as we ate lunch. I think it was the first time I'd ever seen wild ones from a beach and to have them so close (literally right next to where people were swimming!) really was a little magic. After an afternoon dip in the sea, we jumped back on the bike and headed down to Cabo São Vincente. I'd read about the beautiful views on travel guides online, but nothing quite prepares you for how incredible they are in person. It kind of reminded me of lands end in Cornwall, but on a much warmer, bigger scale. We spent about an hour walking around the headland, strolling around the lighthouse, market stalls and a small castle, breathing the fresh salty Atlantic air as we let the jaw-dropping views below sink in. And of course, stopping for some cutie clifftop couple pics along the way – turns out a can of Sagres been makes a pretty good tripod! 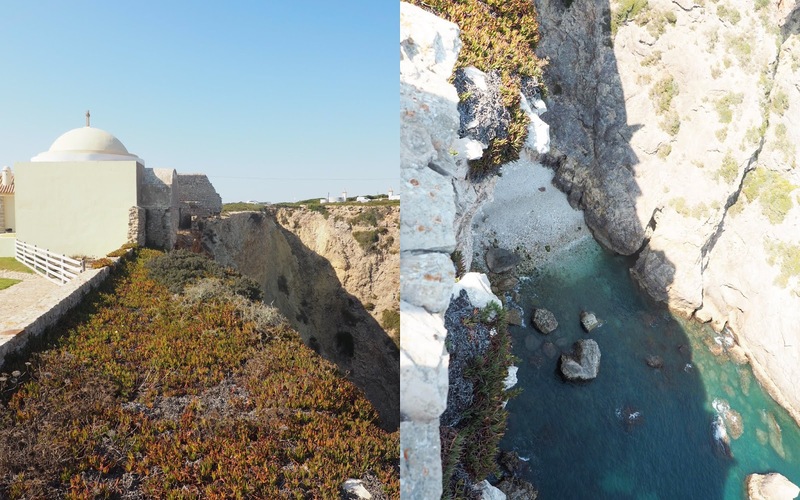 Another well-known spot you can visit here is the fort, Fortaleza de Sagres. We didn't actually inside here because it was pretty late in the day to pay for entry, but could appreciate how impressive it was by just riding up to the gates, if historical buildings are you're thang then this sea-fort is worth a look. I can imagine this area is pretty beautiful at sunset too, but we headed back before then for dinner back in Lagos.